As much as we love our CH kitties, sometimes it would make life considerably easier if they just stayed put! For example, I absolutely love Ellie — she’s always a happy girl and wants to be in the middle of everything. I think it’s fabulous how brave she is to want to be where the action is, but sometimes that can mean she’s chasing after me and getting underfoot, which can be dangerous. It was one day when I was trying to clear out the dishwasher with my little helper when I realized the value of a pet playpen. She was trying to help, in fact, trying to climb into the dishwasher (something we’re trying to teach her is not OK). She was so happy and having so much fun, but it wasn’t very safe for her. I’m sure we all have similar stories. One time or another we just wish these kitties could be in a safe, yet confined area, which is why many folks in the CH Cat Community have purchased playpens. 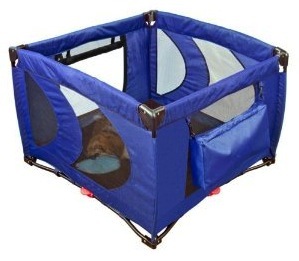 The great thing about most of these playpens is that even while your kitty is inside of it, she will most likely still be able to see you, which can be a great comfort to her. 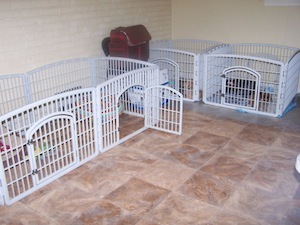 Consider your pet’s abilities and needs: Is a playpen necessary? How often would she use it? How long would she be in there? Where would you use it (indoors or outdoors)? Could she escape? How easy is it to transport, clean, etc? 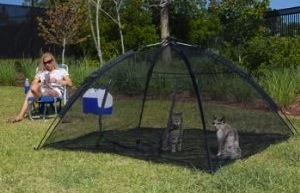 How big is it and what would you need to fit in there (bed, litter pan, food and water)? Can your kitty jump? Is there a top on it or could she jump or climb out? How do other owners rate its ability to withstand wear and tear? Be sure to read the reviews: This can save you a good deal of time and money, especially if past purchasers of the product think it’s defective or if another model is superior. If there aren’t any reviews, check with the CH Kitty Club, Google the product name or ask folks on Twitter if they’ve had experience with the product. What do you think? 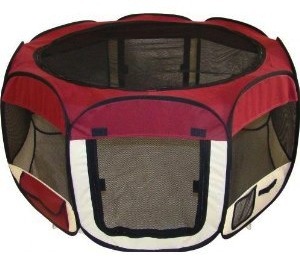 Do you own a pet playpen? How has it worked with your crew? If not, would you consider purchasing one? Please share! We just went camping and took my CH kitty Percy with us. I had bought a second hand child’s playpen for him before we went and it was PERFECT for Percy, and he actually enjoyed having his own little domain. 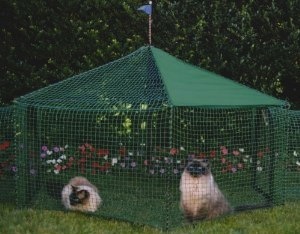 A playpen is perfect for severe CH kitties! Kim: I’d love to see a picture of your Lil Babes. Maybe we should all send in pictures of our CH kitties!